The Young and the Restless (Y&R) spoilers for Monday, August 7, tease that Cane (Daniel Goddard) will bump into Juliet (Laur Allen) again. He’ll suggest that meetings like this are inevitable, so he might as well share his news. It sounds like Cane will announce that the truth came out about the Hollywood footage. He’s the one who deserved the backlash, not Juliet. Nevertheless, Cane is paying the price for his actions. He already lost his job thanks to all the sexual harassment drama, but now he fears he’s lost Lily (Christel Khalil), too. Cane lied about the blackmail plot and the money he transferred from the twins’ school account. Lily could only take so much, so she threw him out of the house. 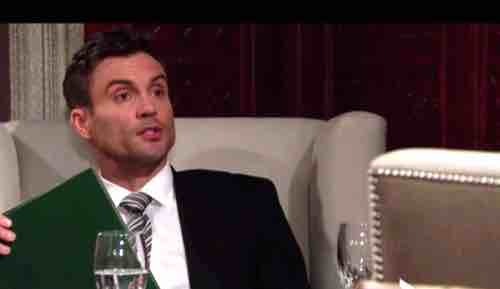 The Young and the Restless spoilers say Cane will hope they can work things out, but he won’t be certain that it’s possible. Will this separation lead to a divorce? Time will tell, but Y&R fans might be more interested in finding out what Juliet does next. Will she view this as a window of opportunity? Juliet will be angry about everything Cane cost her, but she still might want a future with him. Everyone will be anxious to see what happens now that Lily is pushing Cane away. Meanwhile, Billy (Jason Thompson) will also feel distant from Victoria (Amelia Heinle). He’ll be surprised when she doesn’t answer her phone, but he’ll try to brush it off. Billy will tell Phyllis (Gina Tognoni) that Victoria probably just got an early start. Of course, Victoria definitely isn’t ahead of the game. In fact, she’ll feel like she’s fallen behind when she wakes up in bed with Ben Hochman (Ben Hermes). Victoria will be confused about how she ended up there. An undiagnosed health issue could be causing some erratic behavior. Unfortunately, Y&R spoilers say Hilary (Mishael Morgan) will spot the pair and realize what went down. She’ll give Jack (Peter Bergman) updates on Victoria’s hot night with Ben. Jack will be taken aback by the revelation, but he’ll find a way to use it to his advantage soon enough. It looks like more trouble is brewing for Brash and Sassy. We’ll keep you posted as other Young and the Restless details emerge. Check CDL The Young and the Restless spoilers often for updates and news! Sign up for our newsletter by clicking here and get the latest breaking soap news!